One of the paradoxes of the medical marvel known as general anaesthesia is that in helping us to get well, those anaesthetic gases are also heating our planet. Now, a remedy may be at hand in the form of an innocuous-looking white powder developed by University of Melbourne scientists. Every year more than 300 million major operations take place in hospitals around the world. Each has the potential to greatly improve or even save a life, yet many rely on gases that, as well as making patients unconscious, contribute to global warming. 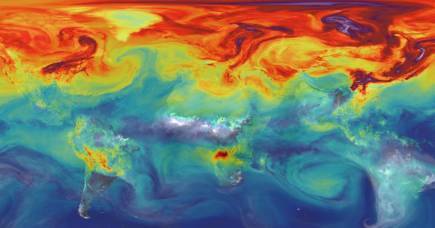 Some of these gases are thousands of times more potent than our best-known greenhouse gas, carbon dioxide. When you consider that a busy, mid-sized hospital has been estimated to produce greenhouse gases equivalent to up to 1200 cars, “the global warming potential is considerable,” says University of Melbourne researcher Associate Professor Brendan Abrahams. And it is not only the environment that is at risk. 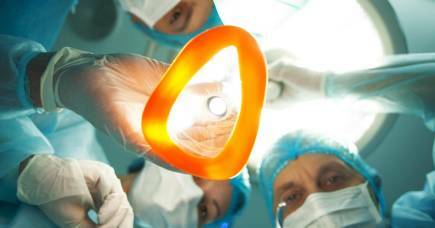 During surgical anaesthesia, some of these gases leak into operating theatres and veterinary clinics where, over time, they may pose health risks (occupational exposure to anaesthetic gases has been linked to inflammatory responses in theatre staff). But the vast majority of these gases are expelled from patients’ lungs and flushed outside into the atmosphere where they act to trap heat. Imagine then that these gases could be somehow captured, stored and maybe even recycled? Besides helping tackle global warming and the health of workers, might this make it possible to dramatically reduce surgical costs? Imagine, too, a technology that could not only capture potentially damaging gases, but that could even be used to harvest from patients’ lungs one of the cleanest, rarest and safest anaesthetic gases known to medicine? A gas that has no known impact on either the environment or surgical staff. This is one of those serendipitous science stories that began not with a problem looking for an answer, but with an answer just waiting for the right problem to come along. The groundwork was laid the late 1980s when University of Melbourne chemist Professor Richard Robson pioneered a new technology that allowed scientists to design and generate materials known as co-ordination polymers, which contain holes large enough to hold small molecules. The inspiration for this research came from the construction of molecular models which Professor Robson designed for use in undergraduate chemistry lectures in the 1970s. To the naked eye, it looks a little like white crystalline powder or perhaps fine sand. But zoom in and what you see is something that might more closely resemble an IKEA storage cabinet – a sort of molecular scaffolding. 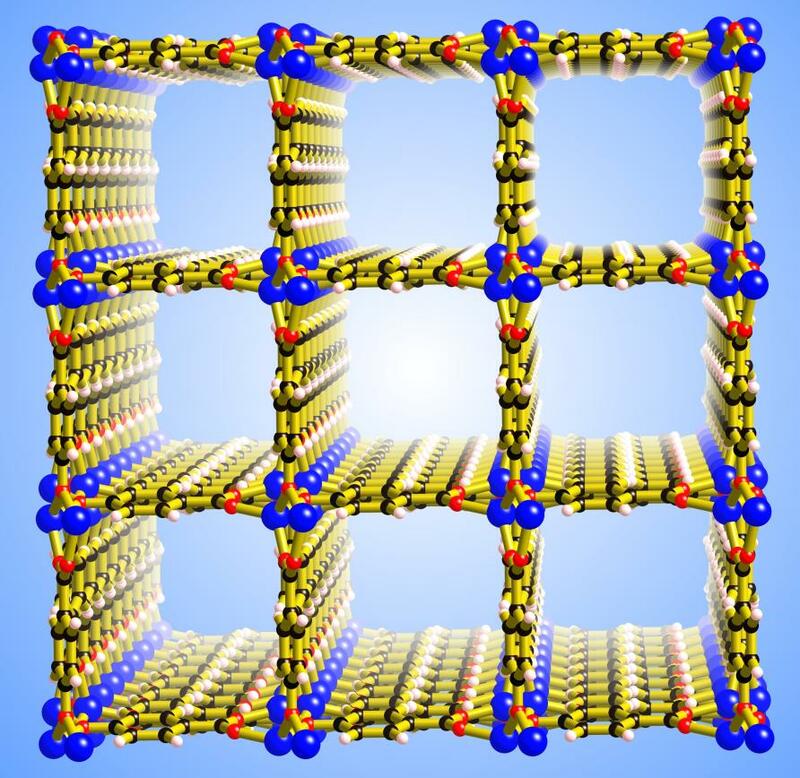 These porous structures have since been deployed for uses including storing gaseous fuels (such as methane), and purifying chemical compounds. Many have also shown unusual and possibly useful magnetic and electronic properties. Fast forward 20 years or so to University House, and the spring of 2012. Dr Abrahams is having coffee with a colleague. They are chatting about co-ordination polymers that the Robson-Abrahams team have already created to see if they can be used to separate and store CO2 molecules (it turns out they can, but not at commercially viable prices). Then Dr Abrahams’ colleague, Dr Paul Donnelly, has another idea. 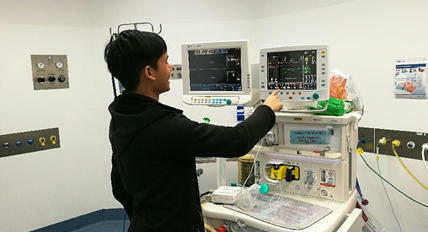 Part of his own research involves anaesthetising mice; now he wonders out loud whether the technology could be repurposed. The team have since developed a new family of “tuneable” polymers that can be tailored to fit individual anaesthetic gases. Big holes for big molecules, snugger holes for smaller ones. Their findings were recently published in Chemistry. They have managed to capture and store two commonly-used inhalation anaesthetics, isoflurane and sevoflurane. They now plan to turn their attention to another popular vapour, desflurane. The researchers have already established that once the gases are captured, the co-ordination polymers can be reheated slightly until they release the vapour into an apparatus where it then cools down and condenses back into liquid form. Ideally, says Dr Abrahams, the next step is to see if the gases can be recycled (the molecules are just molecules, so it makes no difference how many sets of lungs they pass through), reducing waste and costs. Then there is xenon. Considered by some the perfect anaesthetic, this inert gas is non-explosive, non-flammable, relatively non-toxic – and doesn’t damage the environment. The problem is that it is rare - 87 parts per billion. And expensive. 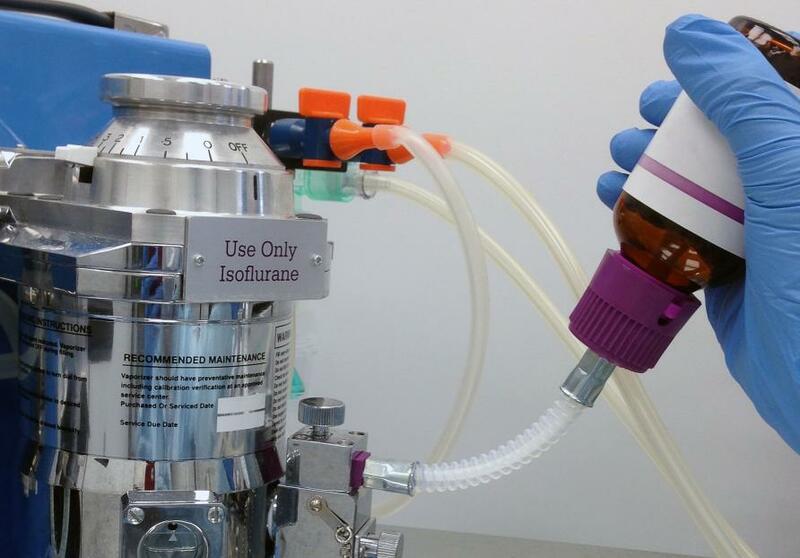 The Robson-Abrahams team have managed to capture xenon with their co-ordination polymers, and hope this might eventually boost the gas’s use in operating rooms. “If you could capture all the xenon back from the patient, then it may become economically viable,” says Dr Abrahams. The group has recently filed a patent and Dr Abrahams is now seeking funding to develop the technology on a commercial scale and explore the possibilities for recycling the captured anaesthetic gases. Kate Cole-Adams is a Melbourne journalist and author of the recently-published Anaesthesia: The Gift of Oblivion and the Mystery of Consciousness. School of Chemistry, Faculty of Science, University of Melbourne.